This excursion is your rare chance to swim with the gentle giants that to feast on bonito fish—not humans, don’t worry! 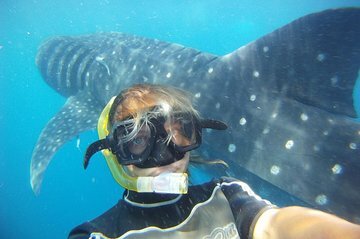 Board a boat with up to 10 passengers and your friendly crew and set out to find where the whale sharks are. Dive in with your guide, whose job is to keep you and the shark safe and happy, while you enjoy this once in a lifetime experience. Coffee and a light lunch is included, nothing heavy for the swimmers!